Callaway Digital Arts, creator of several extremely popular Sesame Street apps, has just released another education hit for pre-school aged children. ‘Endless Alphabet’ features a crew of colorful monsters who are eager to teach children letter sounds and words by using animations, puzzles, and games. As most parents know, reading success begins early. This engaging app teaches the reading basics to the youngest learners by usings adorable monsters. Each word taught by the monsters also has an interactive puzzle game. These puzzle games feature taking letters and even short video clips that demonstrate the definition of the words which help to expand little vocabularies. 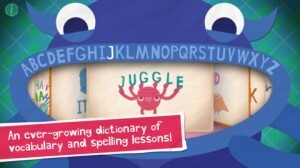 ‘Endless Alphabet’ also sports additional features to make for even more monster-y alphabet fun! Frequent Updating- The folks at Callaway Digital Arts know that, eventually, every app can get boring without new content. Not ‘Endless Alphabet’, though! There are tons of vocabulary words built into the app and dozens more will be delivered to the app automatically in the future, so your child will never run out of things to learn! Small-Child Friendly- When kids are just starting to ‘learn’ in a formal way, the last thing they need is competition, stress, or an overly fast pace. ‘Endless Alphabet’ contains no high scores or opportunities to fail, just a friendly app that allows children to interact at their own pace. Games- In addition to the video clips and puzzles that teach new vocabulary words, there are mini-games that teach what each letter looks like and the sound that it makes. Phonics have never been this fun! With incredible educational features like these, why shouldn’t your child play with monsters? Kids will have a blast being taught the basics by these cute little critters. ‘Endless Monsters’ can be downloaded for free for a limited time only via the Apple iTunes App Store button below. This app is available for both iPhone and iPad.